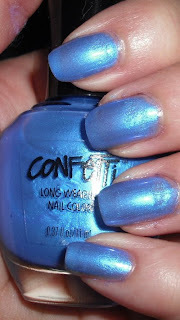 I've seen a few bloggers recently post about new brand of nail polish displayed called "Confetti". I've heard it dubbed CVS's version of Sinful Colors. They have a wide selection of colors that are $2 a piece. I bought 3 and I'm going to give you my review on the brand. Overall, I'm on the fence leaning towards not liking this brand. There are things I really like about it. If you are just starting up a nail collection I think this brand would be good. You can find many popular colors and get your basics covered for a cheaper price. I also found this brand helpful for me even though I have a large collection. It would be a great brand to go to fill in holes in your collection. If you're missing certain colors or you want to dabble in a new color you're never tried to before this brand would work out well. I saw a shade called "Moonstruck" that looked just like $OPI Metro Chic. It is great in that sense being able to substitute pricey colors for lesser expensive ones. The things I didn't like is when I saw this display at a price of $2 a bottle I was so excited. At $2 I knew I could fill up my basket without feeling guilty. However, these colors didn't "wow" me. I didn't really see anything I hadn't seen before. I found the colors very basic except for a handful. I'd say probably 80% of the brand were cremes. There were hardly any shimmers or glitters. The application of the ones I bought were inconsistent, and I as left with bald spots after 3-4 coats. Also, some of the formulas were quite thick and the brushes on 2 of them were misshaped and frayed out. If I were to compare Confetti to Sinful Colors. Sinful Colors would take the cake. They have a more interesting and unique selection. Their formula is also much better. I wouldn't completely dismiss Confetti though. They did have some colors Sinful didn't. I would probably shop the brand if I was looking for some specific I didn't want to spend more money on. 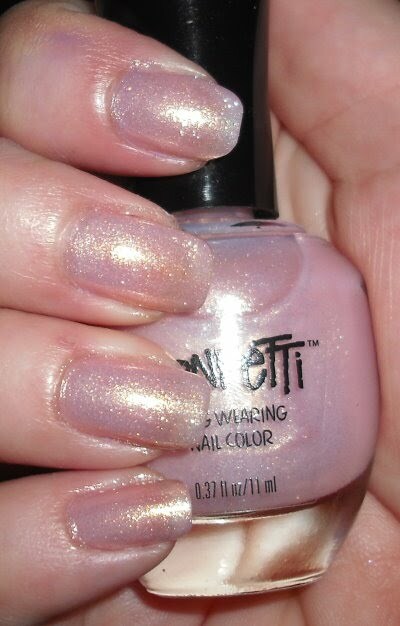 Dreamdate is a sheer shimmery baby pink with iridescent gold I'd almost say glass fleck? I'm not sure how to describe the finish. I really love this one. I think it would be better off for layering, but it's a nice soft shade with some extra sparkle! First of all I apologize. Before I took the photo it looked like I had full coverage on the nail, but I guess not. This was 3 coats. Belle of the Ball is a light purple creme. Like I said before, this is a color I don't have in my collection, so I saw this as a good polish to add since I wasn't really lemming a similar color from a specific brand. The application and formula of this was pretty awful. My brush was frayed, the formula was thick, and I was left with bald spots. That being said I like the color and I'm hoping some nail polish thinner will help it out! Blue Bombshell is a VERY sheer pearl-like shimmer blue. This is a very pretty color. 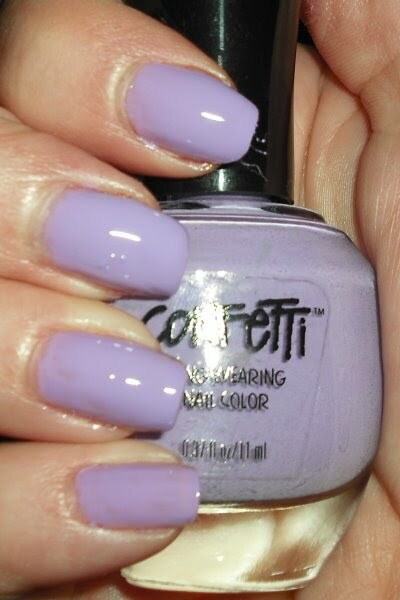 This was the only polish of the 3 I bought that the brush wasn't messed up and the formula seemed normal. I like this color, but be prepared to layer on some coats. That's all I got. The more I write the more I realized how I am more displeased with this brand than pleased. These are just my opinions though and I encourage you to try them out for yourself. I'm not going to cut them off completely, but I know what to expect in the future! I just saw them for the first time last night. There were a some I'll probably go back and pick up: the light purple creme you got, a couple glitters, a green shimmer, a taupe creme. I'm curious how some of the colors compare to ones I already have. dreamdate is pretty! i may have to go to a CVS soon. KarenD- That was my worry when I saw the color selection. It looked like many of the colors I have or many colors that I didn't find all too interesting. It's definitely worth it to get those colors you don't have. That taupe creme was awesome! rmcandle-Belle of the Ball is great purple! I'm so happy I now I have a light purple creme. amused- Lol yes it is very funny. I do love my extra bucks though! Caitlin- Yeah it does stink. I'm wondering though if I just got a bad bottle. I thinned it out with some nail thinner and it's much better now. Kaitlyn- Yes I love Dreamdate! I put if over a pink creme and it looks gorgeous! katherine- I think since the price is so low it is worth a try. 1 of the bottles I got had great application. It could just be hit or miss as far as that goes. Recessionista- Yes yes I remember you saying that! I've been hearing a lot of good reviews on the application of these from others. I'm wondering if it was the colors I got or they were just bad bottles? The brushes were thing that really threw me off. I really should of looked at them first. Perhaps, those bottles had a rough trip to that CVS :P? I think I may go to another store and do some more investigating and testing. Okay, I'm still going to try the brand since I have ONE opportunity to pick some up this weekend, lol. However, I'm going to be very selective of my color choices. Wish me luck! Steph, you ran out and got some, eh? The first one I swatched was Moonstruck. I should have it posted by this weekend. I picked colors that I knew I didn't have and ones that were out of the box for me. And, I fell in love with Moonstruck! The blue is quite nice. And the lilac. :) This brand is probably great for testing out colours that you're not sure of. And despite the crappy quality of the ones you bought Steph, there seems to be quite a few empty spaces in that display. Whole colours, missing. So it can't be too bad overall? I just got moonstruck. I'm excited about it but the brush in my bottle seems a little bent. I have 10 colors in front of me....SERIOUSLY! I found this blog while trying to find a list of all of the Confetti colors because it is all I use and the little CVS I shop at doesn't have any of the other colors. I LOVE this line and use it when I get my fills with the acrylic overlay.